After the collapse of the late VII-VIII centuries, the Gupta empire in India formed numerous states and principalities. In the south-eastern part of the country the leading role passed to a prosperous state, Pal-lava. Here the great construction created an amazing temple complex in Mahabalipuram near Madras. 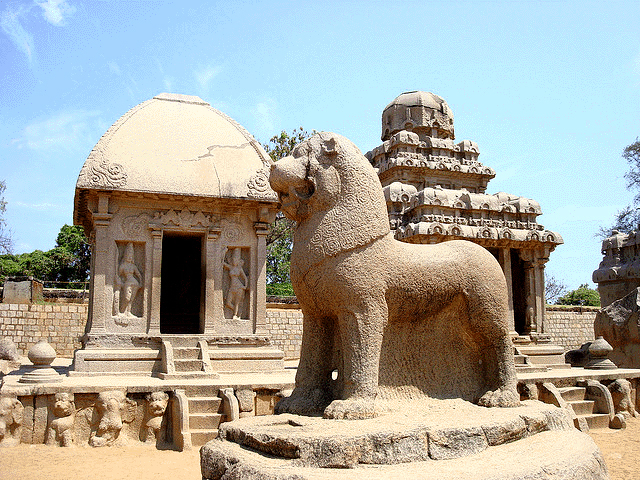 Mahabalipuram was built during the reign of Narasimhan havarmane-I (640-674) dynasty of the Pallavas, also known under the name of Mahmalla. 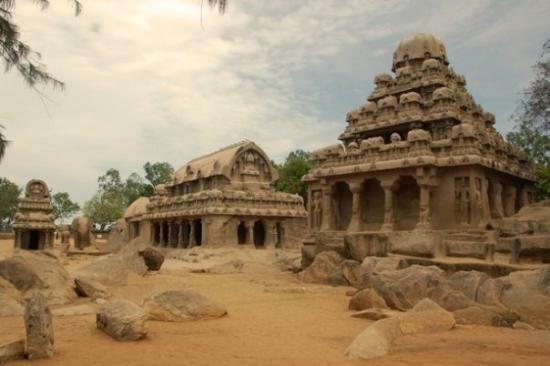 Located on the seacoast, among the sand dunes and cliffs, Mahabalipuram temples are extraordinary, as if this architectural complex emerged by magic. It includes the central coastal temple, five small rock Rath temples, a complex of cave temples and impressive carvings known under the name of “Descent of the Ganges”, which is quite unique among the world art. Beachfront Mahabalipuram temple is the center of the sanctuary. It is a high-relief ShikharTower, a pyramid-shaped, rising on a square platform with a pedestal-going around the gallery. Visible far from the sea, it was even in the VII century equipped with navigation lights, which helped the fishermen and sailors to find their way in the night sea. The temple walls support the statues of the sacred bull Nandi, dedicated to Lord Shiva. The lobby and the tiny intermediate premise are adjacent to the main tower. Through the intermediate premise it is possible to get in a big hall used for ceremonies and supported by the strong colonnade. Paved courtyard of the temple is surrounded by stonewall, on which everybody can see the sacred bulls. Many sculptures of the temple, including the number of its interior decoration, were destroyed, and the reason is not the war but the humid marine climate. 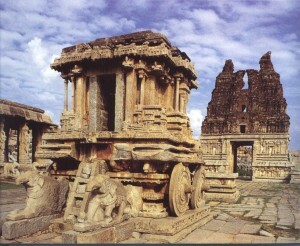 Small temples-ratha are named after gods and epic heroes: Arjuna-ratha, Dharmaraja-ratha, Bheema-ratha, Sahadeva, and Ganesha Ratha-ratha, which was dedicated to the elephant-legged god Ganesha. Rathas were entirely carved out of solid rock with a thoroughness characteristic of sculptural works. The height of the largest of them does not exceed 14 meters. In most cases the inner premises are absent. All five Rathes are different from each other, and in the appearance of each Ratha captured a type of Indian temples that existed at the time. 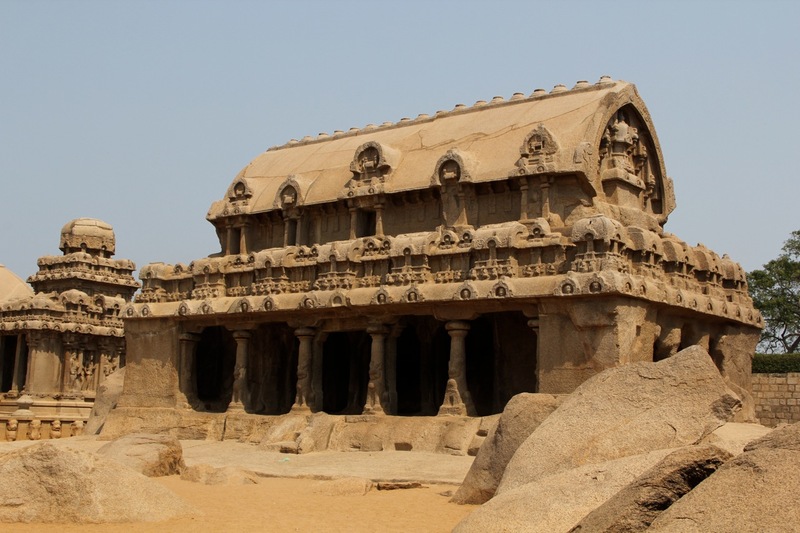 Thus, Rathas of Mahabalipuram are like mini-encyclopedia of Indian architecture. The smallest ratha – Arjuna ratha– is a massive square building with the completion of a dome beveled on all four sides. It is sometimes also called “home ascetic.” Bheema-ratha is a tiered structure with a barrel-like vault. It is rectangular as well, and surrounded by a colonnade. Its appearance looks like Sahadeva-ratha, but it has a lot of decreasing consecutive stages, simulating floors. According to the plan Dahrmaradzha-ratha is a big, square construction, completed by high pyramidal superstructure. 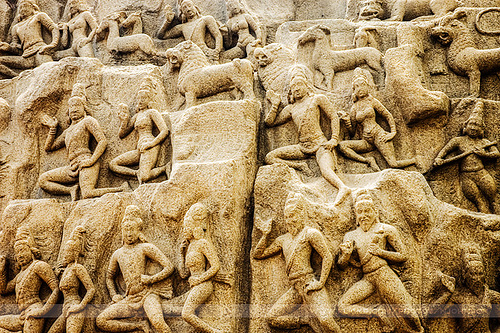 This resembles a lot the simple models of “real” Indian temples from different areas, but nevertheless, Ratha Mahabalipuram has an independent meaning and is a real treasure of architecture and decorative art. Sometimes Ratha Mahabalipuram is compared with precious carved boxes. 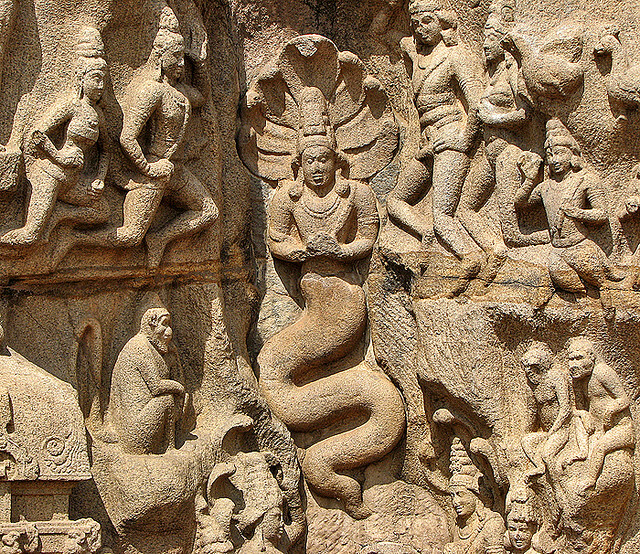 The five rathams are jointed by huge pieces of sacred animals carved from the rock. They are associated with the cult of the god Shiva: elephant, lion, bull. Cave temples of Mahabalipuram are also dedicated to Lord Shiva. Dimensions cave temples do not exceed 8 meters in width and depth. They are considered to be representative of Indian architectural structures of this kind and are carved into the rock hall with small portico in the form of terraces, carefully crafted and decorated by carvings and sculptures. Columns are decorated with sculptures in the form of seated lions. The main elements of these sanctuaries are niches with large multi-figure reliefs on themes of Brahmanic mythology. Among the cave temples there are the so-called Cave Pandava brothers (“Pancha-Pandava Mandapa”) with great relief depicting the god Krishna and a temple dedicated to Shiva Trimurti figures. One of the earliest cave temples is called Krishna Mantaparam. Its reliefs are telling the story of how Krishna lifted the Mount of Govardhan in order to save from Varuna, the god of rain. Unsurpassed masterpiece of medieval Indian art is the immense relief “Descent of the Ganges.” Its length is 27 meters, height – 9 meters. Carved from pink granite, located right in the open air, in the main complex square, it seems to have been designed for large celebrations and rituals. 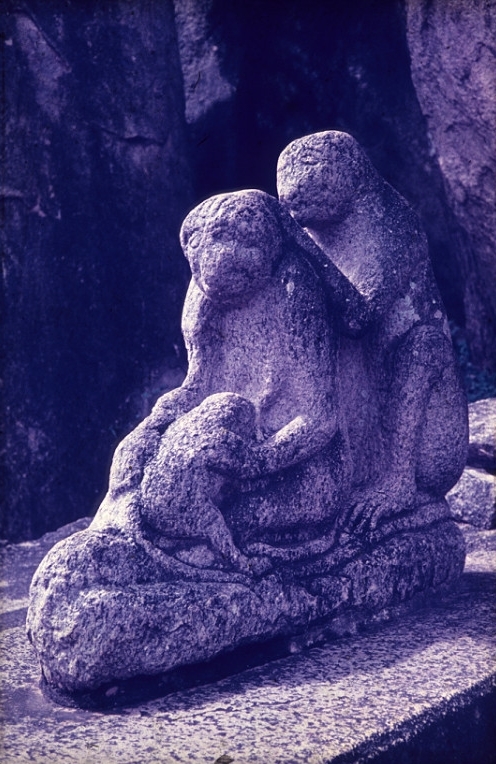 The center of the relief is a cleft. From this place during the ceremonies the water was flowing through the specially constructed waterfall system. This water symbolized the sacred waters of the Gang. Water, so necessary for the welfare of the inhabitants of tropical countries, is subject to public worship. 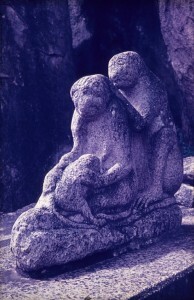 It is directed at by many figures of living creatures depicted in reliefs. Unity gathered the representatives of the “upper” and “lower” areas of the world. 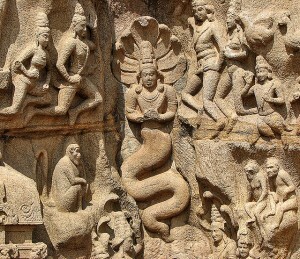 Everything directed toward the water: heavenly beings, devas, divine musicians Gandharva, water spirits – the huge, writhing serpent-naga, the brahmin priest and wise men; nobles dressed in robes, monks-ascetics and ordinary people, carrying the water in vessels on their shoulders, animals and birds. The vast multi-figure panorama is overflown by innumerable kinds of living beings, celestial neighbors with the earth, the mythic intertwines with reality. Under flying celestial beings, devas and Gandharvas, there are the monumental sculptures of life-size figures of elephants and elephant calves. 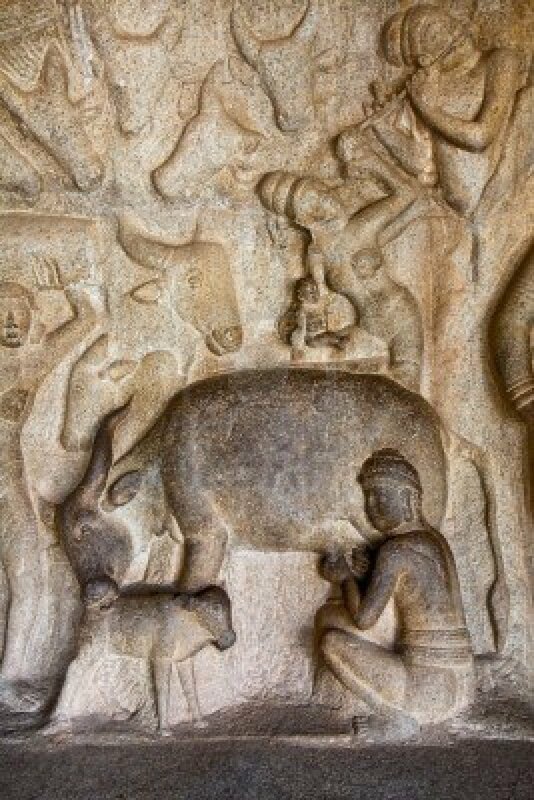 Here there are purely domestic scenes: ascetic priests are praying at the wall of a small sanctuary or women, who are milking buffaloes. The entire composition is blessed by God Shiva, the figure is depicted on the left of the cleft. 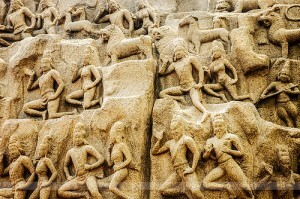 The relief “Descent of the Gang” in Mahabalipuram has played a huge role in the art of India and neighboring countries. Its motives are clearly seen in many Indian dwellings, in the reliefs of Indonesian Borough Badoureau and in temples of Central Java and Ceylon. On the shore of the Bay of Bengal in the Indian state of Orissa there are majestic, extremely impressive ruins of the temple of the ancient Hindu god Surya, the god of Sun. It is considered to be one of the largest temples in India. For a long time the European called it the “Black Pagoda”. This stone colossus climbing alone on the desert shore served as a guide to them in their numerous trips. Surya temple of Konarak was built by the governor of Orissa the Raja Narasimhadeva I in XIII century. This is one of the last and largest buildings in honor of the god of sun. Orissa ruler Raja Narasimhadeva I (1238-1264) from the Gang dynasty made a series of successful wars, as a result of them he conquered the neighboring states, after that he began to raise funds for a grand building, which was intended to Rajah the mercy of the gods and the prosperity of the state. On the construction of the church it was spent not only the war booty, but the tribute of vassal princes and the gifts of Raja’s relatives. The area, chosen for the construction of the temple, had been held sacred for a long time and also it was associated with the cult of the Sun. The very name of Konarak – “Con-Ark” – means “Land of sunlight.” The construction of the temple began in a “favorable” the fifth year of the Raja government and lasted for about eighteen years. Stone for the construction – granite, basalt, sandstone of various shades – was brought by water from three distant quarries. Fantastic building the temple of the sun was once graced by the tower of 60 meters high. It was name like Shikhar. Today it resembles a heap of ruins. From two parts of the sanctuary only the eastern part was remained. It is the building of the Hall of Columns, where there is the entrance to the temple itself. The main part of the sanctuary tower Shikhar, was destroyed either by a natural disaster, or as the result of the raids of the Muslims in the middle of the XVI century. The fact that the destruction of the temple was caused by some hostile forces, is mentioned in the temple record.